THE WORLD’S FIRST BROMETHALIN SOFT BAIT! NEW Cannon Soft Bait provides integrators and livestock producers with the most palatable formulation of a bromethalin rodenticide. Fast acting Cannon Rodenticide delivers outstanding control of both mice and rats in 24 – 48 hours. Cannon Soft Bait’s no-wax 8 gram (0.28 oz.) pouches effectively eliminate rodent populations during short cleanout or depopulation periods, or Cannon can be used as part of a rotational rodenticide program. Time is money, and mixing two rodenticides can add to labor costs. Cannon is your NEW single rodent control product when baiting during cleanout or depopulation periods. No more mixing meal bait & pellets! Highly palatable Cannon Soft Bait provides excellent control of mice and rats in a single nights feeding, and has shown unrivaled consumption when compared to competing purple bromethalin wax blocks. Cleanout baiting is an important step in a biosecurity program, to eliminate rodents during short periods of time between flocks or herds. Cannon comes packaged in convenient NEW user friendly 4 pound bags and contains approximately (227) 8 gram soft bait pouches per bag, the perfect size for properly baiting broiler, turkey or swine operations during cleanouts or de-pops. 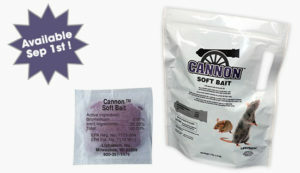 Cannon Soft Bait is your best choice as a cleanout or de-population rodenticide! Cannon also provides lower cost placements and less bait waste compared to purple wax blocks. The pouch can be used like a conventional mini-block secured in a bait station, or end-users can strategically place its unique presentation in tight, hard to reach places where mini-blocks will not fit, targeting where rodents live and reproduce. Numerous side by side field trials in agricultural operations have proven mice and rats readily consume Cannon, while leaving behind purple wax blocks. Cannon’s no-wax formulation does not melt in high temperatures, or lose its palatability in cold weather, making it an excellent choice for any environment. Rodents cease feeding after consuming a lethal dose, making it the low-cost rotation partner when switching to a bromethalin rodenticide.